But there was a desperate need for heavy equipment to reach possible survivors buried in collapsed buildings, including an eight-story hotel in Palu where voices were heard in the rubble. A 25-year-old woman was found alive during the evening in the ruins of the Roa-Roa Hotel, according to the National Search and Rescue Agency, which released photos of her lying on a stretcher covered in a blanket. At least 832 people were confirmed killed by the quake and tsunami that struck Friday evening, Indonesia's disaster agency said, with nearly all of those from Palu. The regencies of Donggala, Sigi and Parigi Moutong — with a combined population of 1.2 million — had yet to be fully assessed. It was not immediately known when the burial would take place, but "this must be done as soon as possible for health and religious reasons," said Willem Rampangilei, head of the National Disaster Mitigation Agency. Most of Palu's residents are Muslim. In Donggala, the site closest to the epicenter of Friday's earthquake, aerial footage on Metro TV showed the sugary blond sands of beaches swept out to sea, along with some buildings. Some buildings in the town were severely damaged, with plywood walls shredded and chunks of concrete scattered on the pavement. Much of the damage, however, appeared limited to the waterfront. 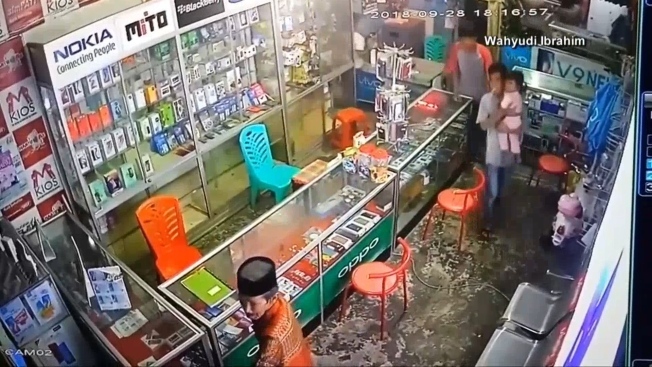 Looters hit a badly damaged shopping mall, apparently unconcerned for their safety amid ongoing aftershocks and the structure's questionable stability. Nugroho said 61 foreigners were in Palu at the time of the disaster. Most were accounted for, but one South Korean was believed to be trapped in the Roa-Roa Hotel, while three others from France and one from Malaysia were missing. The survivors were to be evacuated to the Sulawesi city of Makassar in the island's far south. Associated Press writers Margie Mason and Stephen Wright contributed.